The Madonna with the Christ Child and Saint John the Baptist is a 1506 painting by Raphael, now held in the Kunsthistorisches Museum in Vienna. It is also known as Madonna del prato (Madonna of the Meadow) or Madonna del Belvedere (after its long residence in the imperial collection in the Vienna Belvedere). The three figures in a calm green meadow are linked by looks and touching hands. The Virgin Mary is shown in a contrapposto pose, wearing a gold-bordered blue mantle set against a red dress and with her right leg lying along a diagonal. The blue symbolizes the church and the red Christ's death, with the Madonna the uniting of Mother Church with Christ's sacrifice. With her eyes fixed on Christ, her head is turned to the left and slightly inclined, and in her hands she holds up Christ, as he leans forward unsteadily to touch the miniature cross held by John. The poppy refers to Christ's passion, death and resurrection. 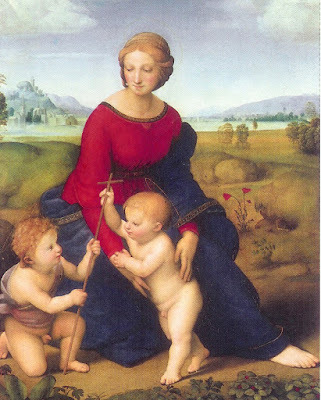 The new series on Renaissance painting, written and presented by Matthew Collings, begins with an artistic investigation into one of the most radiant and beautiful images in all of art history, The Madonna of the Meadow, painted in 1505 by Raphael. Renaissance art has become part of the 21st-century heritage industry but when Raphael was alive, it was a startling new form of visual expression, and Raphael's vibrant 'realism' was striking and fresh. It became the model for western art for the next 400 years, right up until the birth of Modernism. As much as it was a cultural 'rebirth', the Renaissance was also a revolution in ideas about reality. Matthew Collings sets out to remind us of how radical Renaissance paintings were when they were made, as well as opening our eyes to what is still truly great about them. In this programme he deconstructs The Madonna of the Meadow with the help of the very latest high-resolution digital technology, which allows him to explore the inner secrets of Raphael's painterly effects with a clarity and at a level of detail never before seen on television.